Marilyn Carbonell, head of library services at the Nelson-Atkins Museum of Art, is leading the project. Photo by Nathan Lang. A treasure trove of the work, culture and history of Kansas City’s creative community is being carefully documented—one artist at a time. Marilyn Carbonell, head of Library Services at the Nelson-Atkins Museum of Art, first developed a passion for capturing and preserving the work that artists do when she was in college. More than 30 years later, in spring 2013, she looked around a room of artists assembled for a Nelson event and a light bulb switched on. With the museum’s blessing, the Artists’ File Initiative (AFI) was born. The process began with collaboration. Carbonell consulted museum leaders, curators, library staff, commercial galleries and artist organizations to identify local artists. She then created what she calls a decision matrix, logging each artist’s accomplishments, such as completion of art school, exhibitions and recommendations from different organizations. Using this process, she was able to identify which artists to contact about creating a file of their work. Today, more than 250 artists have earned a spot on Carbonell’s matrix. More than 75 have already begun depositing information in their files in the Nelson’s Spencer Art Reference Library. Those files contain much more comprehensive information than you will find in any other artist database. Each folder is unique and might include artist statements, exhibition reviews, resumes, gallery announcements, exhibition cards, installation shots and more. “Essentially by contacting, collecting and documenting artists’ lives, works and careers, the Nelson-Atkin’s Museum of Art is creating a necessary platform for schools, researchers, publishers, editors, students and the adoring public to utilize a resource that can create an awareness of all of the fine art being made and shown in the greater Kansas City area,” Weiner said. Janet Simpson, executive director of the Kansas City Artists Coalition, has played an active role in AFI, particularly in teaching artists how to archive. It’s the intangible impact of AFI that appeals most to the artists participating. “Being invited to participate in AFI made me feel like somebody cares about what I’ve done with my life. It’s wonderful,” said Jane Pronko, who describes herself as passionately addicted to painting since 1969. The 80-year-old artist said going through decades of her work has made her realize AFI is more than just for the artist’s exposure. “It’s like a time capsule of what was happening in the art world at a certain time,” Pronko said. Kansas City artist Hugh Merrill was one of the first depositors in AFI. He echoed Pronko’s thoughts, adding that the AFI is another example of how the art world is shifting from embracing mainly international work to the inclusion of artists from near and far, those currently working and those who are deceased. Part of that commitment to artists is recognizing that the way they are communicating about their work is shifting from a print medium to digital. Heather Gendron, president-elect of the Art Libraries Society of North America and director of the Haas Arts Library at Yale University, led a project similar to AFI in North Carolina and has been collaborating with Carbonell. Carbonell says it’s a challenge she’s ready to tackle with her community of support. For Carbonell, the AFI is not just a project. It’s the culmination of her whole life’s work. Each day, she thinks about a poem she has held close to her heart for many years. She said it inspires her work. “It’s called ‘Electra’ by Marilyn Hacker,” she said. “I think it’s so important to remember all of the great work being done,” Carbonell added. Anyone can search the Artists’ File Initiative online by visiting www.nelson-atkins.org/research/library/. 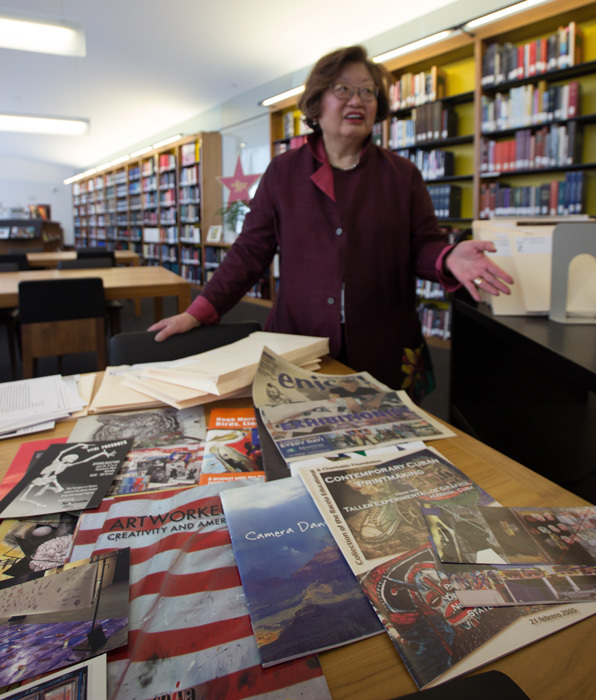 The files can also be viewed at The Spencer Art Reference Library in the museum’s Bloch Building, 4525 Oak St. Library hours are 10 a.m. to 5 p.m. Wednesday, Thursday, Friday; 10 a.m. to 6 p.m. Saturday; 1 to 4 p.m. Sunday; and Tuesday by appointment.